It’s so interesting to me how sometimes I suddenly become aware of a process that has been years in the making. For those of you who don’t know, I have natural, freeform dreadlocks. Now, I support any way a person chooses to wear their hair, and within the dreadlock community, I support all the different ways that people choose to form their dreadies. For me, though, after doing some research, it became apparent that the best option was to allow my dreads to form naturally, with minimal interference on my part. My partner and I have spent the past 2 years seeking a more natural lifestyle. We’re working piece-by-piece to replace chemicals with natural (often homemade) products, buying more local, organic produce, buying local pasture-raised meats, using less and recycling more, and growing dreadlocks together. Our change in lifestyle is coming about as a result of spiritual change and growth that is making us more aware of our relationship with all of the Universe. And this is where my dreadlocks come in. I feel that my dreadlock journey is parallel to the spiritual journey that I’m on. In the beginning, all I knew was that I didn’t want to continue as I had been living. Leaving shampoo for the baking soda/essential oils soak and the apple cider vinegar rinse was akin to leaving Christianity. It’s what most everyone used/did and was the most acceptable option available to me. But it wasn’t right for me. I wanted to live differently. After a little while, my hair started to look messy, and so did my beliefs. I wasn’t sure what I believed anymore, and I was trying out a lot of different things. If anyone had asked me to explain what I believed at that time, I wouldn’t have known what to tell them except that I knew when I got to the end of my searching, everything would be fine. And the same would be true of my little (or big) dreadies, but both those outcomes were far in the future, and it would take faith to believe in them and patience through the more messy time on the way. 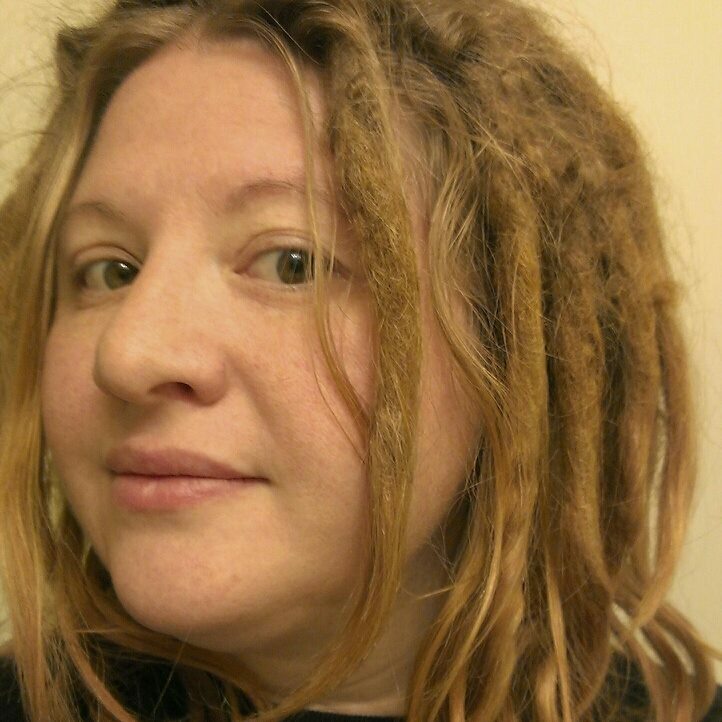 My dreadlocks at 1 1/2 years. Now, at a little over a year and a half into both of these wonderful journeys, I’m starting to see the maturity that has come from learning patience and peace, recognizing and allowing bumps and loops to work themselves out over time (in my dreads and in my life) instead of forcing them into my idea of what or where they should be, and I’ve even started decorating them. Everything is starting to take form, and I’m beginning to see a little of what the future holds. It’s all very exciting and beautiful!